36mm Diameter by 74mm Long Brushless Motor by TFL Racing. Hand wound for high efficiency of up to 90%. Comes with high quality bearings and neodymium magnets for high power. Includes endbells that are assembled with screws for both strength and ease of maintenance. Pedro Monteiro, The motor will have more torque than a stock motor. Also draw more amps. It should go faster in the ProBoat BJ29 and be able to spin a bit larger prop than the stock motor. 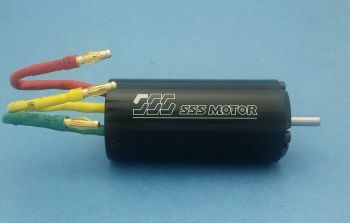 Can this motor be used in a Proboat BlackJack, V3, with original motor mount ? Any remarkable improvement when compared with stock motor ? Max volt. For this motor ? It depends on the application. Please consult our tech support at info@offshoreelectrics.com to help with your particular setup.